our inward seeds of fire? or a thistle head or a chrysanthemum. Let the young rain of tears come. Let the calm hands of grief come. It’s not all is evil as you think. though you’re not aware of it. widemouthed red flowers who sweat reminds us of approaching war. in the seconds that have got permission to live for centuries. She is eight months pregnant, two hearts beating inside her. The wall behind her holds a crinkly map of Terra Incognita. Just breathe. An unidentifiable blue fabric has been tacked to the chairs. as if there had always been stillness and nothing else. The ears experience a buzz, perhaps it’s depth or perhaps height. and makes the brushstroke firm. It’s all one world. Now to the walls. The walls are a part of you. except for small children. There aren’t any walls for them. Commentary: Jan Vermeer was a seventeenth-century, Dutch Baroque painter justly famous for his use of light in his works depicting interior scenes from middle class life. His extraordinary accomplishments have recently come to the attention of the American public because of the novel-turned-film, “The Girl with a Pearl Earring.” In addition, poet Marilyn Chandler McEntyre has written a book of ekphrastic poems on a selection of the painter’s works, In Quiet Light: Poems on Vermeer’s Women. In our poem, Swedish poet Tomas Tranströmer imagines Vermeer’s studio sharing a wall with an alehouse … the chaos on the alehouse side, the light and life on the art-studio side … and the open attitude of the artist to whatever may come through the wall or from the airy sky. As I read, I couldn’t help but remember the story from the Gospels of how Jesus appeared to his disciples, walking through a wall when the door to their hiding place was locked. C.S. Lewis has written that to Jesus in his resurrected body, the wall was as ephemeral as mist is to us when we take a walk on an autumn morning. Another human being could not have done it, because “walking through walls hurts human beings,” but Jesus did. Last night, I went to see the film “Bright Star” directed by Jane Campion. It is the love story of the 19th century, Romantic poet John Keats and the muse who inspired him, Fanny Brawne. The film gave me a whole new vision of Keats, a different perception of his poetry, one which is based more on empathy than on judgment. The whole film is radiant with desire. The memory and the fear of death intensifies love’s longing in the story. Fanny’s father’s death and Keats’ brother’s death, remembered at the beginning of the film, foreshadow the end when Keats dies of complications of tuberculosis in Rome. After Fanny learns of the poet’s death, we see her cut a black thread that she has stitched into a white cloth. The image, so powerful in its simplicity, recalls the Greek myth of Atropos cutting the thread of a man’s life. Throughout the film, as Fanny and Keats converse, they quote some of Keats’ most famous poems, beginning with his claim that “a thing of beauty is a joy forever — its loveliness increases! It will never pass into nothingness, but still will keep a bower quiet for us, and a sleep full of sweet dreams and health and quiet breathing” (from “Endymion”). As the film goes on, they speak verses that Keats wrote after he met Fanny, and it becomes clear, so clear, that she was a great source of inspiration for him. His poetry was not coming from some abstract place, but from the center of his being responding to the center of hers. Fanny was a real, beloved person to Keats, and Campion makes her and her poet real to us. Campion does this in a new, fully-alive, sensuously rich way. Her film is like a living poem speaking from the past into the heart of the golden present. I went home after watching the film and read dozens of letters and poems by Keats: sonnets like “On Sitting Down to Read King Lear Once Again,” “When I Have Fears that I May Cease to Be,” and “Bright Star” as well as odes like “To Psyche,” “To a Nightingale,” “On Melancholy,” and “To Autumn.” How different to meditate on the romances “Eve of St. Agnes” and “Lamia” with Keats’ relationship to Fanny Brawne acutely in mind! For these songs came from Keats’ secret life, the one he revealed in letters to Fanny, letters that he covered from the sight of his friends even as he wrote them in their houses. Of course I admit that the film is a love story that simplifies some of the uglier jealousies and misogynies Keats sings out in his letters to male friends and even to Fanny herself sometimes. But it still gives us something important to remember. Love gave Keats life. p.s. In the film, Keats says, “Craft is a carcass … If poetry doesn’t come as naturally as leaves to a tree than it had better not come at all.” This made me laugh! Yes, Keats made his metaphoric comparison between poetry and tree-leaves in a letter to Benjamin Bailey, but did he therefore mean that poetry comes easily? I’ve watched the leaves split open twigs to emerge after winter, and I think the growing process is neither painless nor easy, though the revivification of the tree is, of course, a wonder to behold. Earlier this week, my friend Wendy and I went to watch a movie at the Ogden 6 Theater. Right beside the theater is a bargain bookstore. They have a sale going: buy the four books, get the fifth one free. This was just too thrilling for words. I picked up a Stephen King’s memoir On Writing, the selected letters of the poet John Keats, a collection of poems by Louise Erdrich, another collection of poems by Mark Doty, and an anthology of haiku, with contributions from Basho, Busan, and Issa, edited by Robert Haas. I’ve been reading, in a sort of slow, meditative way, a book on memoir writing by Dan Allender called To Be Told and the collection of haibun called Haiku Mind by Patricia Donegan. I thought it would be good to read King’s perspectives on memoir since I knew he would have a different sort of kick to his advice. I’ve always enjoyed Stephen King’s prose style. It’s journalistic, Hemingway-esque. His content is always reminiscent of Edgar Allan Poe. There can be little doubt that Stephen King is Poe’s modern counterpart, his literary descendant, the inheritor of his gift. Some of King’s books I’ve never wanted to read, but Firestarter and The Dark Tower were two I enjoyed. here is a bear’s song in the cool-scented snow. Jane’s new collection of fantasy stories is now available from Lulu press! 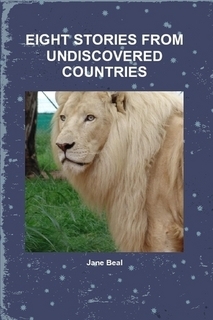 Eight Stories from Undiscovered Countries includes the genres of fairy tale, allegory, magical realism, folk-tale, short fiction, fantasy, and medieval romance. In each of Jane’s stories, discovery and adventure await the young imagination! The stories treat important themes: a child’s need to be loved (even when he is imperfect! ), the possibility of moving ahead even when abandoned by friends, the urgency of the needs of those living in poverty and our responsibility to share generously with the rest of the world, the healing journey of the soul after the experience of childhood trauma, new life after death, how to love honorably, and the unexpected adventures a young knight experiences in his life. Eight Stories from Undiscovered Countries at Lulu Press!